Bioware's martial arts RPG is now available DRM-free at GOG. GOG's library of RPGs is already pretty well stocked with classic pillars of that genre. That said, role-playing fans will still probably appreciate the digital retailer's latest addition: Jade Empire. Developed by Bioware and originally released for PC's and Xbox in 2005, Jade Empire at GOG will come complete with the original manual, the game's soundtrack, a digital artbook and other nifty extras like HD wallpapers and GOG avatars. The game is currently selling at a discount to celebrate its release on GOG, making it a good time to swing over and pick up a DRM-free copy of the game. The game itself is arguably one of the more unique entries in Bioware's repertoire of releases. 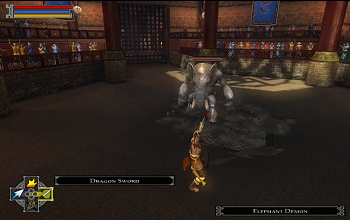 You play as a Spirit Monk fighting against an evil empire in an oriental-themed fantasy world. Eschewing more traditional RPG combat, Jade Empire employs a more active battle system where the player has to use and master diverse styles of martial arts to defeat a variety of challenging foes. In true Bioware fashion, the game also has a strong moral choice mechanic. You'll be asked throughout the story to make good or evil decisions that will shape your character and determine how the story ends. That in mind, it's worth mentioning that you can probably be more evil in Jade Empire than in any other title Bioware has ever made. We won't go into specifics but suffice it to say that if you opt to go the evil route you'll be given the opportunity to do some pretty rancid things to both your friends and enemies. The story also boasts a late in the game twist that is easily just as mind-blowing as the big "gotcha" moment in Knights of the Old Republic.